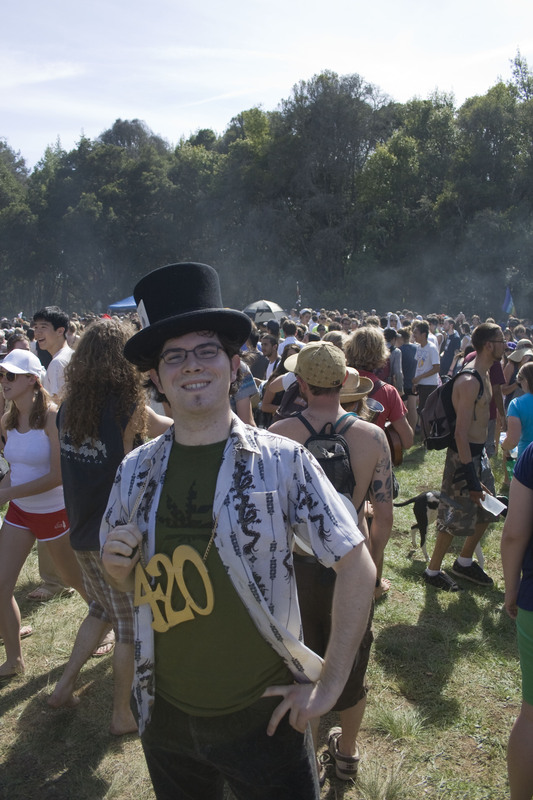 Me at the 4/20 Celebration at the University of Santa Cruz, 2009. Note the pendant and T-Shirt. I would have got this up on 4/20 itself but I was busy working a ten day week at the world’s largest dispensary, making sure our festivities went off successfully (they did). Now I am back with the facts on this unique American holiday. Growing up in California, specifically in Marin county and San Francisco, I have been steeped in cannabis culture all my life. This makes sense since San Francisco is where the hippie movement originated. So it is no surprise that I have known the significance of 420 and the myths behind its origins from a tender age, since before I knew the significance of 666 (one of those side effects of being raised as a Buddhist hippie). Over my twenty six years in the Bay Area I have heard all manner of stories about why 420 is associated with cannabis, ranging from the plausible to the ridiculous. I’ll be profiling and debunking the most prevalent ones then giving you the real low down on how 4:20 became the time to smoke and April 20th became the day. I’m going to start with the most ridiculous then move to the most plausible. Bob Marley’s Birthday/Death: April 20th is not either Bob Marley‘s birthday or the day of his death. April 20th is the Best Day to Plant Cannabis: Any experienced grower will tell you this is a load of bull. The best time to plant depends on where you live, current climatic conditions, whether you are planting indoor or out, and numerous other contextual factors. Many people choose this day as a day to begin planting but there is no real reason other than a personal choice. The Number of Chemical Compounds in Cannabis: While more plausible still wrong, there are currently 315 identified chemicals in the cannabis plant. We still don’t have the full chemical profile of cannabis, and we knew even less back in the 70’s when 420 was started. Police Code for Cannabis: Police codes change from one country to another and from one region to another, but to my knowledge 420 is not a police code for cannabis related activities anywhere for any agency. 420 does happen to be the code for a homicide in Las Vegas though (in many area’s it is 187). The Number of the Congressional Bill to Legalize Cannabis: Unfortunately no, there is no bill currently introduced that would legalize cannabis this session, usually there is and there is bipartisan support for it. 420 is the number for Senate Bill 420 which expanded California’s medical cannabis program in 2003. That’s it for the major rumors and myths in need of debunking. You may now be left wondering, if that is all bogus then what’s the real story? The real story on how 420 became the magic number for everything marijuana related is the story of a group of kids from San Rafael High School in the early 1970’s. This group was known as the Waldos because they would gather and smoke around a wall after school at 4:20pm. Or at least that is how the Waldos’ legendary story was first passed on to me many years ago, when I was a highschool student myself, smoking near a wall at 4:20pm after school. But here is the full story of the Waldos and how 420 originated in the words of Waldo Steve himself. One day in the Fall of 1971 – harvest time – the Waldos got word of a Coast Guard service member who could no longer tend his plot of marijuana plants near the Point Reyes Peninsula Coast Guard station. A treasure map in hand, the Waldos decided to pluck some of this free bud. You may be wondering how something that began 40 years ago as an inside joke to keep things discreet in front of teachers has since become a world-wide phenomenon spawning any army of “genuine 420” Made in China swag. The rest, they say, is history. The Waldos weren’t just ‘some kids’ they were some kids who had connections to people like Phil Lesh, David Crosby, Wavy Gravy, and The Grateful Dead. 420 spread out along the same vectors as Tim Leary‘s acid trip and the hippie movement, spilling out to touch every corner of the globe. In 1990, Steve Bloom of High Times was given a 420 flier at a Grateful Dead show and High Times began to incorporate 420 into their magazine. 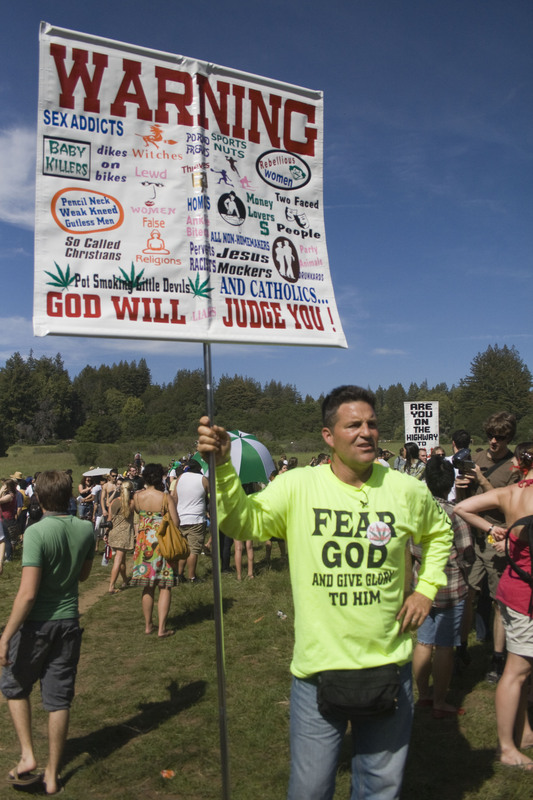 Rick Pfrommer, former Director of Education at Harborside Health Center, was working for the Cannabis Action Network at the time and they used their access to Kinko’s to print thousands of copies of the original 420 flier that Bloom saw. Thanks to Pfrommer and Bloom 420 went viral in a very short period of time and soon April 20th became a day for smoke outs and concerts everywhere. Unfortunately, not everyone is okay with the spread of cannabis culture and the mass acceptance of this utterly harmless drug (seriously, less harmful then potatoes). I take comfort that it was only angry white men with signs. Soon they will die out from a lack of mates as crazy as they are.